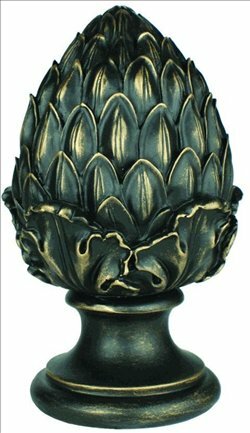 Artichoke Finial -- BasicQ Inc.
Artichoke finial for 2 1/4 inch wood curtain rods. Size is 6 1/4 inches long by 4 inches wide. In stock colors are ready for quick shipment from factory. Renaissance Collection by Design Elements. Material: Resin, Availability: Ships in 1 to 3 business days (In-stock), 5 business days (Custom) Priced each.